I'm a big fan of Stephen Jones' anthologies. 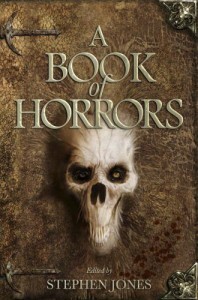 In fact, I was weaned on them, and discovered many of the authors I still read today through his BEST NEW HORROR series. This one, however, was curiously uneven. For a collection whose sole purpose (according to the intro by Jones) is to make horror horror again, there's a distinct absence of scares, or indeed, much horror at all. Standouts include "Ghosts With Teeth" by Peter Crowther, which, while not particularly original, manages under Crowther's always capable hand to be extremely well-developed and frightening, "Roots and All" by the always reliable Brian Hodge, "Getting it Wrong" by Ramsey Campbell, "The Man in the Ditch" by Lisa Tuttle, "Sad, Dark Thing" by Michael Marshall Smith", and "Last Words" by Richard Christian Matheson. Entries by some of the biggest names fall flat, especially King's "The Little Green God of Agony", which reads like a Tales from the Crypt story, which would have been more acceptable back in the Night Shift era, but just seems weak here. Dennis Etchison, perhaps one of the finest practitioners of the short form, delivers an uncharacteristically disappointing entry too with "Tell Me I'll See You Again", which aims to be poignant, but ultimately fails to be anything but confusing. Overall, not a bad anthology, but far from the stellar volume I've come to expect from one of the best editors in the genre.